You are currently browsing the tag archive for the ‘teal’ tag. Picture taken in sunlight. This applied well, though it was a little cuticle draggy. I used three coats for full, even coverage, thought the third coat was just barely needed. As in Rock the Boat (these are the only two polishes I bought from this collection), the shimmer is subtle, but still fairly noticeable. The irregular, tiny silver flakes look very delicate and pretty. 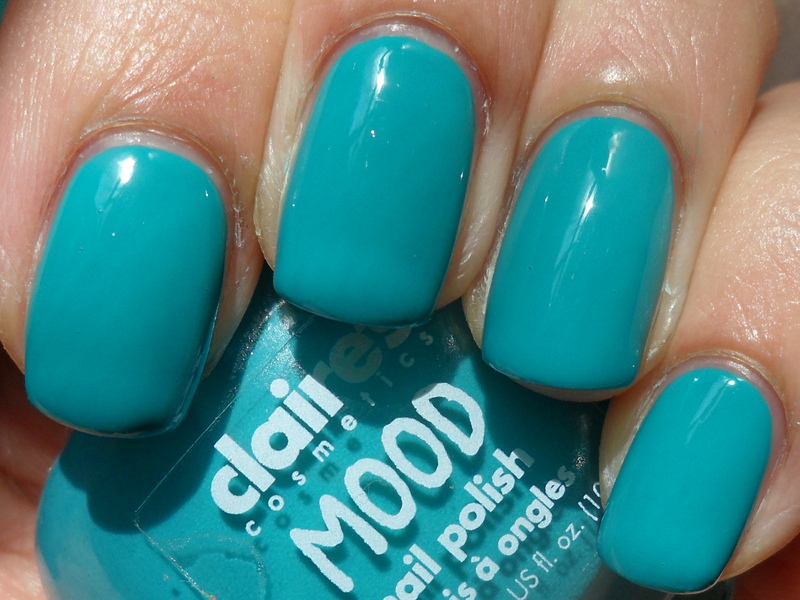 While Rock the Boat’s powder blue shade looked light and airy, this greenish teal looks bright and bold. I can’t resist a teal, so I probably would’ve been drawn to this even if it were a plain creme; I appreciate the way the shimmer sets it apart from other teals I own. I don’t normally associate teals, especially green-toned ones, with nautical themes, but this one looks so crisp and fresh that it actually does make me think of sailing. I paired this with China Glaze Ahoy! on my toes. Picture taken in weak sunlight (Please pardon the injury! I hope it heals fast so it won’t appear in many more of my NOTDs.) The formula was smooth and applied well in two coats. At first this struck me as a more fall-appropriate shade, since it wasn’t light and bright like the polishes I’ve been wearing recently. The more I look at it, though, the more I see it as spring-appropriate. It’s dusty, but not very muted. It’s kind of like a springy version of Essie School of Hard Rocks (both remind me of chalkboards.) It’s not the first shade I picture when I think of teal, but it just fits under that category, as one that has more green than blue. The name intrigues me; I normally wouldn’t think of this as the color of veins, but when I looked at my wrist, the shade seems like a match! I paired this with OPI Wooden Shoe Like to Know? on my toes. Picture taken in sunlight. This applied very well and was nicely pigmented; I got full coverage in two smooth coats. I wouldn’t call it vibrant in a bright way, but it does look like a very bold, strong color on the nail, because of its solid opacity and pigmentation (the sunlight does make it look a bit washed out.) There’s not much else to say about it other than it’s a lovely teal creme. Teal is a color that can vary so much depending on how much blue or green it has (this one is more blue-leaning), so that’s why I think I can’t resist whenever I come across one in a new collection. They may all fit under the “teal” category, but none of them are quite exact dupes of each other. I paired this with Lippmann Purple Rain on my toes. Picture taken in sunlight. This doesn’t exactly have that effortless buttery formula, it still applied well, needing two coats for complete coverage. This was another long-standing untried, and once I had it on I remembered why I wanted it so much. It’s gorgeous! It’s a deep shade, so it looks deliciously vampy in low light. Of course it looks best in the sun, where all the shimmer gets lit up. It’s blue enough to still be considered a teal, but it’s on the green side of things. I like Deborah Lippmann’s description of this as a “mood ring blue/green,” but I look at this and think of beautiful, luxe jewels. I paired this with Nails Inc. Houses of Parliament on my toes. Picture taken in artificial light. (Regrettably, there was no sun for this photo.) The formula was not very buttery smooth, but still applied pretty well. It has a slightly metallic finish so there are slight brushstrokes that you can’t really see anyway because they’re covered by shimmer. I used two coats plus touchups for full, even coverage. Even more regrettably, I couldn’t get this to photograph as it appears in real life at all, so I’d say this is just one to see in person. It looks like a deep, blackened teal straight-on, then as you angle your nails upward it turns into a charcoaly gunmetal, then finally a smoky purple. The duochrome effect is definitely strong; it constantly color-changes as you move your fingers. Sometimes you can see two colors at once; teal in the center and purple around the edges. It’s gorgeous and kind of makes me think of peacocks! I paired this with Sally Hansen Deep Purple (Xtreme Wear) on my toes. Picture taken in sunlight. This applied well, though the formula was on the sheer side; I used three coats to get a really solid, opaque result. I can’t really complain about the sheerness of the base, though, because that’s what allows all the microglitter that’s loaded in there to shine through. The finish is brilliant and gorgeous, and of course looks stunning in the light. Upon closer inspection this doesn’t seem to be just a teal microglitter; I see gold microglitter in there too, making the overall finish more dimensional. I think the gold also pulls the shade to the warmer, greener side, rather than the cooler, bluer side (but as per usual, it photographs a little bluer than it looks in real life.) 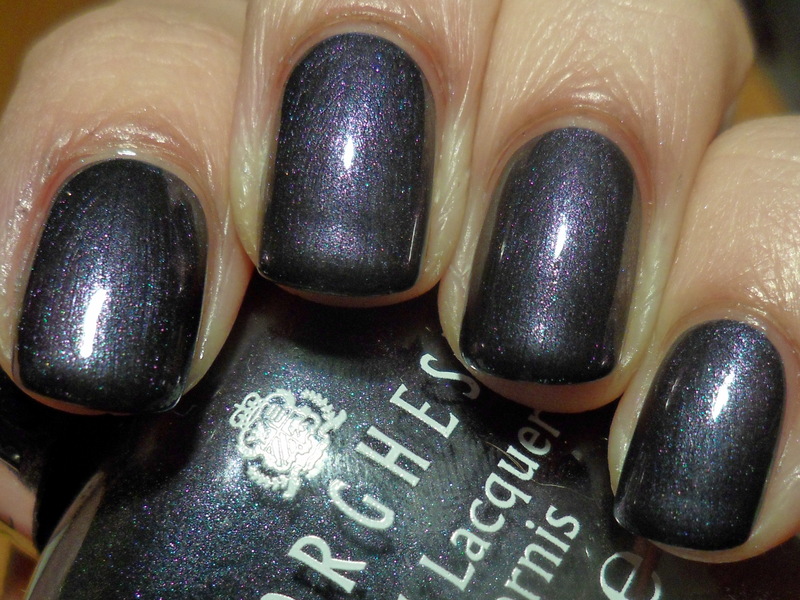 I love this sort of shade; it really reminds me of the sea and mermaids, especially when it’s in a glittery finish. I paired this with OPI Meep-Meep-Meep on my toes. Picture taken in sunlight. (This looks slightly more greenish in real life.) This applied well; the formula wasn’t a solid, creamy sort of creme, but had a jelly-like translucency to it. What I like about this kind of creme finish is that it has that jelly-like squishy look, but since it’s not actually a jelly, it’s not so sheer that it requires three or four coats for opacity. For this I only used two coats, with minor touchups in between. Not that Sephora is totally accurate with the color descriptions on their site, but I was puzzled by their calling this “bright emerald.” It may be a green-leaning teal, but it’s definitely a teal. But when viewing in low, indirect light, it does look emerald green! I love the color as it appears in all lighting situations; it’s rich but also bright and vibrant, so it could work during all seasons. I paired this with Orly Pixy Stix on my toes. Picture taken in weak sunlight. This applied well, like a regular creme polish, in two coats. After a few minutes it starts drying to the satin finish. I actually love the leathery satin look, but only when it turns out smooth! Too often, I find that this sort of finish gets bubbly on me, so I have to work slowly and with thin coats. (I actually had to redo a couple of nails before taking this photo because there were too many bubbles.) I was afraid this wouldn’t last the day so after taking photos I threw on topcoat. It defeats the purpose of the finish but I’d like to go about my day without immediately messing up my nails. (I don’t know how long it takes these satin polishes to truly harden and set, but in the past I’ve messed up my nails even after waiting a considerable amount of dry time.) I still like the teal color so I didn’t mind sacrificing the vinyl look. I paired this with OPI Pamplona Purple on my toes. Picture taken in sunlight. This applied well in three coats. Even though it’s not exactly a neon, it dries to that sort of semi-matte finish, which is a plus because it does dry fast. I could not capture the color-changing on film, and it doesn’t really show up in real life either. I don’t mind, though, ’cause it’s a teal and I find it pretty anyway. The “mood-changing” aspect of it is disappointing, probably because the color-shifting takes place between two shades of the same color. I only really observed it as I was painting it on my nails; it went on as a more blue-teal then I saw it change into the green-teal (which is how it looks most of the time.) I paired this with Sally Hansen Azalea (Salon) on my toes. Picture taken in sunlight. This applied well, though it wasn’t as solidly pigmented as I thought it’d be, so I used three coats for even opacity. There are so many teals out there now that this is hardly unique, but I really can’t resist them! Whenever I see one in a collection I’m so drawn to it. This one is pretty and bright, not neon and not exactly electric-vibrant, but it is a bold shade, a lovely pop of color. I paired this with OPI Suzi & the Lifeguard on my toes.